Find many of our general contact, location, and area information questions and answers below. Where is RedFin Charters located? All of RedFin Charters' boats are kept at Bristol Marina located at 145 Lockwood Dr. Charleston, SC 29403, which is conveniently located downtown Charleston, SC on Lockwood, next-door to the Joe Reilly Baseball Stadium. We are minutes from all of the main hotels located on the peninsula in downtown Charleston on King, Meeting, or Market Street. Yellow cab will transport you for $6 anywhere on the peninsula and Uber is normally around $5. Parking is available, if you prefer to drive. Our main booking number is (843) 277-5255 and it will transfer to whichever guide is off the water to make sure we are always available for phone calls. Please feel free to call anytime and we will be happy to answer any questions. You may book over the phone or online. Charters can be booked online or you can RedFin directly at (843) 277-5255. We require a $100 deposit to hold a trip. We take any major credit card. Can you make any recommendations on hotels or restaurants? We will be happy to make suggestions, just give us a ring. We have lived here a long time, and have some definite favorites in the area. In addition, we have several private 2 bed/2 bath yachts for rent if you need a place to stay. Guests on our yachts are offered discounts on our fishing charters. Find many general day of the charter questions and answers below. Boats have limited storage, so please only bring necessities on board. Helpful items include your phone, a towel, hat, clothing that can protect you from the sun, sunscreen, food, beverages, and keys. We have a few water-tight areas on board, but please be aware that your things might get wet. If you are concerned, it would be helpful to bring a zip-lock bag for items that cannot get wet. We will supply everything you will need to fish, if you have a specific rod you would like to bring, that is fine. Your captain will be happy to check the rigging so you don't end up with "the one that got away" story. What should I do for lunch? Please feel free to bring a packed lunch and something to snack on for yourself for half day charters and because it might be difficult for you to get to a store. our captains will be happy to pick up whatever you need before the trip for a nominal fee at your request. For full day inshore charters, we are happy to provide a complementary shore lunch ("daily catch") cooked at a local creekside restaurant, or a packed lunch for those of you who don't want a break in the action. Please let us know in advance which you prefer. What about a bathroom break? We can take a bathroom break whenever requested. It might pull us away from the fish for a few minutes, but we don't want you to be uncomfortable. Inshore Charters are relatively close to a marina or restaurant on the water. We are happy to stop at either for your convenience. Our larger yachts have bathrooms on board. You may park in the Bristol Marina parking lot if that is your designated departure location. You will walk down the dock and we are the first set of boats. The captain will wave you down. Find many general fishing questions and answers below. How many people can fish from your boat? Do to coast guard regulations, we are limited to 6 on a single boat. In general, fishing is best when there are fewer people on the boat. If you have 6 in your party and you are all intent on fishing without getting lines crossed, consider booking two boats rather than one. If you have a larger group, check out our group fishing charters page explaining our fishing tournaments for bachelor parties, executive retreats, family reunions, and team building. We just love to fish- inshore, nearshore, shark, artificial, live bait- we do it all! If there is a species you want to target, or a type of fishing technique you want to use, please let us know. Do I have to bring my own tackle? No. RedFin will provide rods, reels and tackle. Will I need to rig my own lines or bait my own hooks? The RedFin Charter's captains will do all the work. All you need to do is reel in the fish of your dreams! (We are happy to give pointers on casting/reeling to beginners or those who haven't fished in a while. We can also cast for you if needed). A fishing license is included in your charter, so you do not need to purchase an additional license. How many fish can I keep to take home? Our captains abide by the latest rules of the DNR which can be found here. We practice catch and release for redfish as they are semi-protected, but will happily filet any other fish while following the South Carolina DNR regulations. Fish cleaning is complementary on all inshore charters. What about fishing with kids? We all know children are sometimes impatient and need pretty steady entertainment. Our captains tend to be very good with kids and will try to keep them engaged while also educating them in the process. We encourage parents to bring their kids fishing and pass on our sport for generations to come. We recommend fishing for sea trout, as there tends to be more exciting bites on the line. We are also happy to build a custom package that allows some time for fishing as well as beach combing to get some energy out. Let us know about your situation, and we will do our best to accommodate your needs as a family. When is the best time to fish in Charleston, SC? We have year-round fishing Charleston, SC, though the types of fish we target will change with the seasons. Some months are better than others for select species. Your captain will help you target the fish that are prevalent at the time of year you are fishing. Please see our fishing calendar for more information. Find many general pricing and payment questions and answers below. Each charter is priced differently, please see prices listed on the page of each type of charter. What does a fishing charter price include? The price includes fishing licenses, bait, rods, reels, tackle, water, and ice. For full day inshore charters, we are happy to provide a complementary shore lunch ("daily catch") cooked at a creekside restaurant, or a packed lunch for those of you who don't want a break in the action. Please let us know in advance which you prefer. Though tips are not mandatory, they are very much appreciated. Has your RedFin captain tried everything possible to put you on fish and worked really hard in the process? Maybe even when the conditions were less than favorable? Did they explain new fishing techniques and did you learn something new? Our guides have had experiences where they have walked away from a charter with no tip, and other experiences where they will be tipped $200 in appreciation of their work. A Typical tip for a half day trip is $80-$100 and a full day is $100-$140 based on the experience you have. Why are some charters more expensive than others? Some types of charters involve more fuel or more effort to coordinate, which is reflected in the pricing. You can book online using a Visa, Master Card, Discover, or American Express. In addition, we will also take cash. You can purchase gift certificates here. Can I split a charter with someone? Yes. A $100 down payment will be due upon booking, and the rest can be split any way you prefer. Find many general cancellation, refunds and weather questions and answers below. What is your cancellation policy? Do I get my deposit back? Booking a trip with a $100 deposit ensures that a captain is reserved for you and you alone. If you need to cancel your trip for any reason, please call us as soon as possible. This will allow other anglers the opportunity to take your time slot. If you cancel by phone more than 48 hours in advance, you will get a full refund of your deposit. If you cancel 48 hours or less in advance of your charter, your deposit will go toward a future charter within the next 12 calendar months if there is availability. In the event of a no show, you will forfeit your deposit and be charged the full amount of the charter as well. A little rain never hurt anyone, but lightning can hurt. Our captains are trained to watch the radar closely and determine the safety of a trip. If the weather is deemed by the captain to be dangerous, we will happily refund your deposit. If your trip is cancelled due to weather, we will do our best to reschedule your charter on a different day with better weather if at all possible. Please know that weather is unpredictable in Charleston, and forecasts (even a few hours in advance) tend to be inaccurate. Cold temperatures bring great inshore fishing to the Lowcountry. The redfish have schooled up into the mud flats and can be found in groups from over 50 - 100 fish. These fish go into shallow water to stay on the warm mud and hide from their predator the dolphin. This gives us a great sight fishing opportunity with the clear water and large groups of fish. Sheepshead, black drum, and redfish can also be found on nearshore wrecks just off the beach and can make for a great day on the bigger water. This month marks the transition from winter to spring habits for most inshore species. Slot redfish make their way further inshore to shallow water to feed aggressively, while large redfish make their way to the harbor. We target redfish in the harbor and off the beach during this time of the year near deep drop offs and structure on the bottom with heavier tackle using bobber rigs or blue crab. This time of year is also a good chance to catch some of the shallow water fish on artificial baits and on the fly. 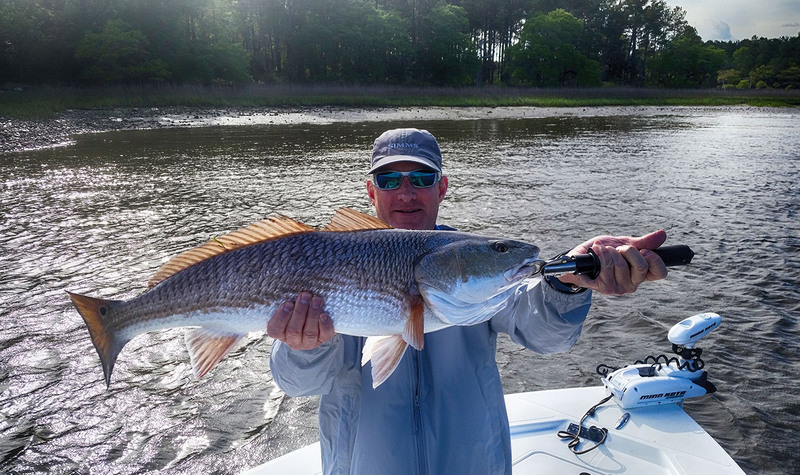 Redfish are easiest to target around the lower end of the tide, while large numbers of trout can be targeted around the grass line and oyster points during high tide. We target sea trout with a float rig with a shrimp or mud minnow, drifting it along the grass edge. Once the water is lower the trout stage on deeper drop offs and ledges but can still be caught on bobber rigs or an artificial on the bottom. Slot redfish are aggressive and willing to feed in smaller pods along the shallows using shrimp under a popping cork or a blue crab on the bottom. Bull redfish from 15 - 35+lb put up a great fight, and are plentiful. We target them using menhaden, mullet, and blue crab near drop offs and ledges. While fishing for the big reds, we also hook other species including sharks from 2 - 8+ feet, and stingrays. Sea trout are spawning and can be caught in large numbers by the bank, including 2-6 lb females. The trout bite progressively gets better with the warmer water and can still be targeted along the grass lines and oyster bars. Big redfish are in the harbor and off the beaches in big numbers. Smaller redfish have continued to break out of their schools and are now in their summertime pods along the bank feeding on shrimp and small baitfish. As the water warms, we target redfish in deeper grass lines and oyster beds. Trout and flounder are also in our inshore waters and can be caught along grass lines and oyster beds. The cobia are coming in to spawn and can be caught in the harbor and just off the beach near the shipping channel and on the reefs. With the water progressively warming up we are also catching much larger sharks in the harbor, ranging from 6-12 feet! During this time the spadefish can also be caught just off the beach, these fish school up and can make for some constant action. With warmer water, our primary focus is in deeper water in the harbor. The big redfish is one of our favorite things to catch during the summer months, as they are getting ready to breed and can weigh over 30 pounds. While fishing for these monsters we catch sharks of all sizes, large flounder, large trout, and many others. Some shark species include Lemons, Blacktips, Hammerheads, Bull Sharks and our favorite the spinner shark that will hook up and go airborne multiple times while fighting. Spadefish can be caught just off the beach and make for constant action. Cobia are coming in close to spawn and can be caught in the harbor and just off the beach near the shipping channel and on the reefs. July marks the start of the tarpon's migration through our local waters, which can be targeted by knowledgeable anglers through the warm summer months. There are also many other species that can be targeted in the harbor, including Spanish mackerel, bluefish, lady fish, and jack crevalle. There are some chilly mornings with the break in the heat, and the summertime fishing starts to transition to autumn. Creek fishing becomes more productive, and slot redfish in the shallows and grass lines are aggressively feeding. Trout fishing also becomes more productive along the grass lines and submerged oyster beds. The annual mullet run has begun and there are large pods of bait along the beaches. This is a great opportunity to find tarpon on condensed pods of bait. The bull redfish are active in the harbor due to the cooler weather, along with other species such as trout and flounder. There are also many other species that can be targeted in the harbor, including Spanish mackerel, bluefish, lady fish, and jack crevalle. This is one of our favorite times of year to fish because the bait is thick, the fish are hungry, and the temperatures are cooling off. Slot redfish in the creeks are feeding aggressively down the banks, so there is a lot of action on the water. We also get a higher quality trout bite this time of year compared to the previous warmer months. Sheepshead and flounder are also fun species to target in our inshore waters this time of year. Bigger fish in the harbor are still active. The breeder redfish go out with a bang in October as they begin to leave our inshore waters. Inshore fishing continues to heat up with the cooler weather. Slot redfish in our estuaries and shallow creeks begin to group up in their wintertime schools of fifty to well over a few hundred fish. These fish are targeted along mudflats and oyster beds during the lower parts of the tide. We do more sight fishing this time of year as the redfish push wakes down the banks chasing bait. During the higher water, we primarily target these fish with float rigs using shrimp, finger mullet, and mud minnows. Artificials can also be used to target redfish with success. Trout fishing is astounding this time of year, as they school up on grass points, rock piles, and underwater structures. These fish are very willing to eat artificials under a float or on a jig head on the bottom. The sheepshead fishing is also still productive this time of year, dropping fiddler crabs down along pilings and rocks. Sheepshead, black drum, and redfish can also be found on wrecks just off the beach and can make for a great day in the bigger water.